It’s been a year since I joined the New York Map Society, and 3 months since I’ve been in London. I’ve blogged about some of my discoveries, but here’s a list of things I’ve done, most of which I haven’t had time to tell you about…..
During Fall 2015 and Spring 2016, I attended several New York Map Society meetings. Including seeing Woman in Cartography in Boston, curated by Alice Hudson. I met Laurie Frick in March 2016. I’ve very inspired by her work and have her app, FrickBits, on my phone. During June, 2016, I made several visits to the New York Public to look at maps. I chose Detroit as my main subject, as a base for the map workshop. Also in June, I went to see the American Geographical Society’s Globe collection at the University of Wisconsin, Milwaukee. This was pretty amazing. The librarian there was very helpful and showed me a great deal of their map collection. I saw a range of maps, which was a good thing, as I wasn’t really sure where to start. And, I did the Three Day Map Workshop at the Osher Library in Portland Maine in June. Here’s the blog post about it. I have yet to finish the map I started there. When I arrived in London in mid July 2016. I looked for cycle maps, couldn’t find any and have been trying digital alternatives since. I am currently on a quest to speak with someone from the TfL about these maps. In August, during my quest for London Cycle maps, I reached out to Derek Lamberton, of Blue Crow Media. I didn’t purchase his cycle map, but I did buy his Brutalist London map and met him for coffee. I’ve been all over London by bike and have navigated by paper map, with a phone, listening to turns. My favorite app is City Mapper, but still like to use paper cycle maps while in London. Around the same time, I met Flora Parrot, and sat in on her mind mapping workshop for kids in the Camberwell Library. Later I met up with her at the Royal Geographical Society’s Annual Conference in late August. I got a reader’s card for the British Library, so I could look at maps in the Map Reading Room. Been there a few times. I also went to the Royal Geographical Society’s Map Room. It was very interesting, but you can’t take photos. I attended the July and October “Late Debates” at the London Transport Museum. The topics center around the TfL, Transport for London, which is a body that oversees how people get around in London. This includes the tube, train lines, buses, river travel, bikes and even walking. Introduced myself to Max Roberts, one of the speakers, who’s specialty is creating alternative Tube maps for London and other cities. Several weeks later I met him for lunch and we discussed transit maps. At the October Debate, I met a woman from the TfL who is helping me meet with others from the organization. I had lunch with people from Google Maps. I met Patrick, James and Oliver, University College London, and discussed maps and the book London: Information Capital. 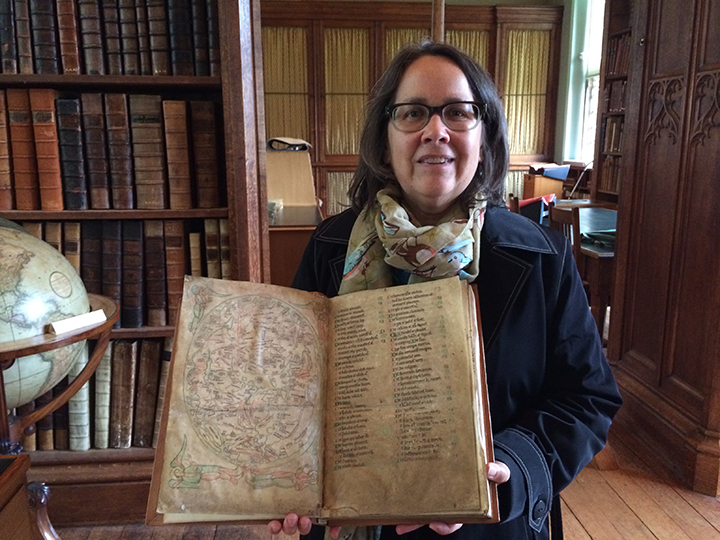 And just yesterday, I held the oldest English Mappa Mundi (ca. 1190) in the Parker Library, Corpus Christi College, at Cambridge University.